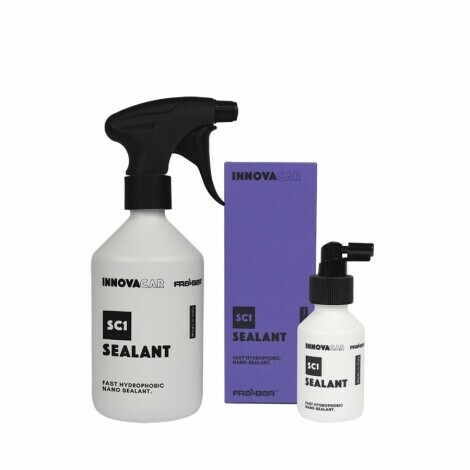 SC1 is an extraordinary quick surface sealant that creates a chemical and molecular barrier thanks to the latest and most advanced nano technology. Its unique formula creates an incredible protective and rainproof effect, with a silky feel to the touch. SC1 is designed to be an easy-to-apply sealer, so it can be applied quickly and easily. It can be used directly on painted surfaces or treated with waxes, sealants and nano-coating, providing its performance without creating build-ups. Spray SC1 once or twice directly on the clean, dry surface (40×40 cm at a time). Apply it carefully (with a ‘criss-cross’ technique) and wipe again with another medium/long fibred microfibre cloth with circular movements to remove any excess until you reach a glass surface. The product is fully activated after 7 hours from application and is able to resist both acids and alkalis. Do not apply it on hot surfaces or in direct sunlight. The best performance is obtained with a completely decontaminated and clean surface with H20 at least every 3 washes.